(Nanowerk News) IMEC presents a unique microchip with microscopic nail structures that enable close communication between the electronics and biological cells. The new chip is a mass-producible, easy-to-use tool in electrophysiology research, for example for fundamental research on the functioning and dysfunctioning of the brain. Each micronail structure serves as a close contact-point for one cell, and contains an electrode that can very accurately record and trigger in real-time the electrical activity of an individual electrogenic cell in a network. Electrogenic cells such as cardiomyocytes (heart cells) or neurons (brain cells) rely on electrical signals to communicate with one another. Knowledge of the electrical activity of these cells is essential to gain insights in the communication process of these cells, to unravel the cause of brain disorders such as Alzheimer’s or Parkinson’s disease, or validate the effect of drugs on cardiac cells in the struggle against cardiac diseases, etc. IMEC’s new micronail chip is the ideal instrument to study the communication mechanisms between cells. 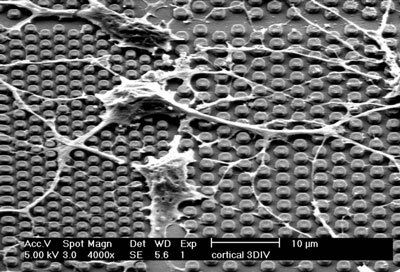 The electrodes in IMEC’s micronail chip are downsized to the size of cells and even smaller. They consist of tiny nail structures made of a metal stem covered with an oxide layer, and a conductive (e.g. gold or titaniumnitride) tip. When cells are applied on the chip surface, their cell membrane strongly engulfs the nail structures, thereby realizing an intimate contact with the electrode. This very close contact improves the signal-to-interference ratio enabling precise recording of electrical signals and electrical stimulation of single cells.